On Thursday, June 14 from 6:00 p.m. to 8:00 p.m., Governor John Hickenlooper and other state officials will speak at The Alliance Center (TAC), 1536 Wynkoop Street, Denver, to discuss the 2018 version of the Colorado Climate Plan. The governor will address how climate actions across the state have and will continue to create economic opportunities, and how clean energy jobs continue to build our state’s economy. Following the governor’s remarks, a panel of the governor’s staff will talk about strategies and actions to address a broad range of sectors including water, energy, transportation, and public health. In 2017, Colorado joined the U.S. 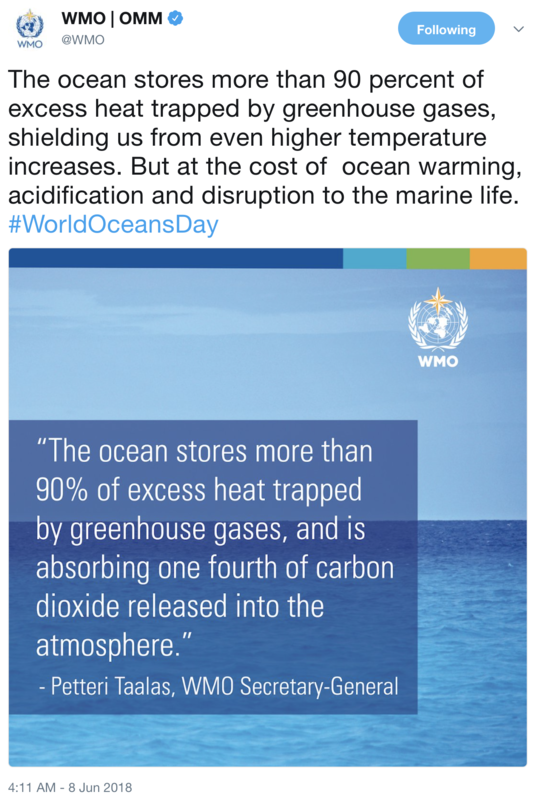 Climate Alliance, a coalition of states pledging to uphold the climate goals of the Paris Agreement, and by executive order, Gov. Hickenlooper created a specific, measurable goal for carbon reduction. The state objective is to cut greenhouse gases by 26 percent from 2005 levels by 2025, and to cut carbon from the electricity sector by 25 percent compared to 2012 by 2025 and 35 percent by 2030. 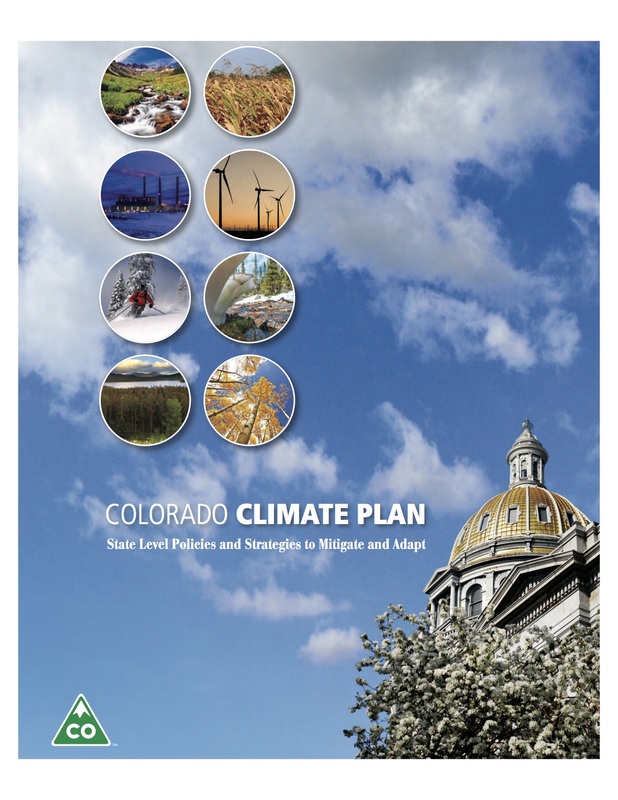 The Colorado Climate Plan, a statewide set of policy recommendations and actions to mitigate greenhouse gas emissions and to increase Colorado’s level of preparedness, was updated to set clear and specific emission reduction goals for the state. This update follows Gov. Hickenlooper’s executive order from July 2017, Supporting Colorado’s Clean Energy Transition and Colorado Electric Vehicle (EV) Plan, which commits the state to additional climate action. This event is sold out, but it will be live streamed here. Spanish translation will be available for in-person attendees. The program will begin at 6:00 p.m. 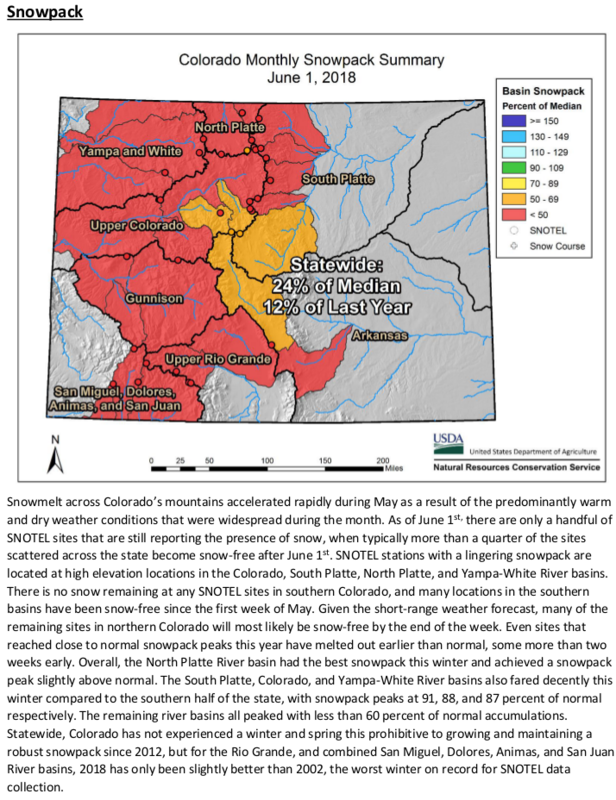 Since the first of May, mountain weather conditions in Colorado have been dominated by a drier weather pattern with snowpack melting earlier than normal. Statewide snowpack on the first of June was 24 percent of normal. 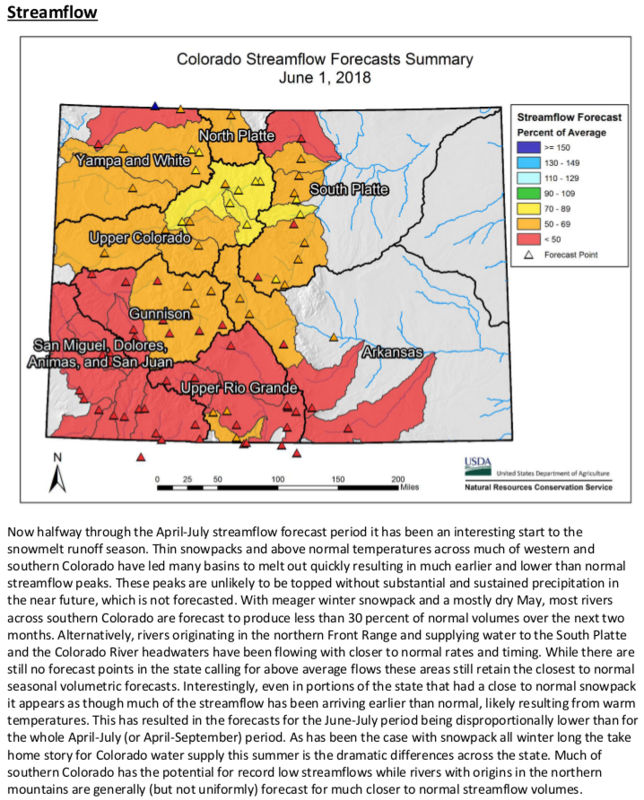 “While these conditions are more favorable for hiking Colorado’s mountains, snowpack and precipitation shortages in May further depleted Colorado’s summer water supply outlook,” says Brian Domonkos, Colorado Snow Survey Supervisor, Hydrologist with the NRCS. In a normal year, on the first of June there are 21 of a total 115 SNOw TELemetry network sites in the mountains of Colorado that show an inch or more of snow water equivalent. However, this year on the first of June only ten sites had any measurable snow at all. With snowpack on its way out, other contributors serve as indicators for summer water supply predictions such as precipitation, reservoirs, and current streamflows. At 55 percent of average, May 2018 precipitation was the second driest month of this water year behind December which was 50 percent of normal. 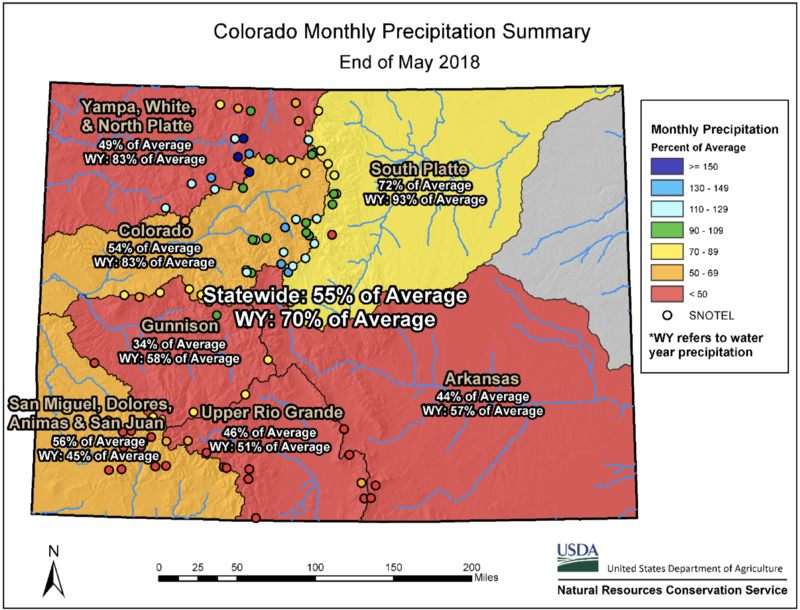 Unlike April, when precipitation was near 95 percent of normal in the northern half of Colorado, May precipitation failed to top 75 percent of normal in any of the major basins across the state. 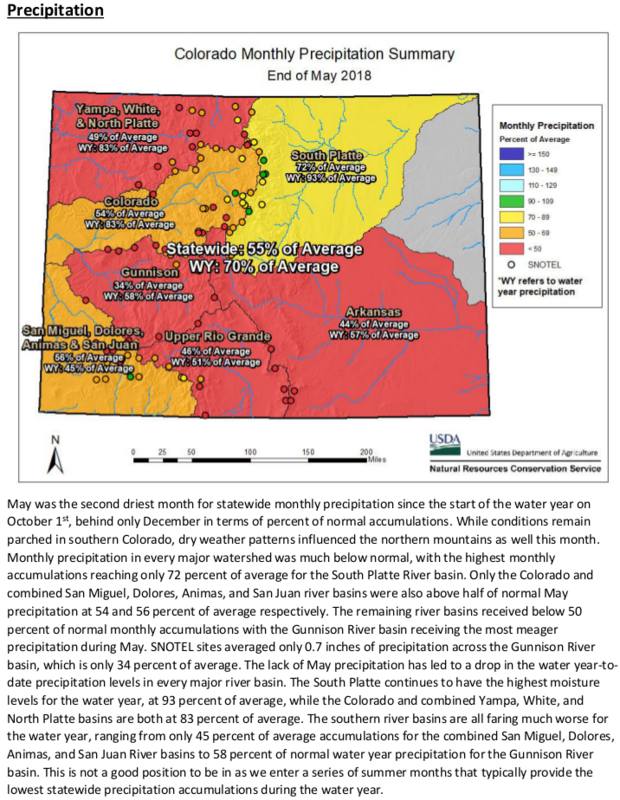 Only three of the major watersheds in Colorado received at least half of their average monthly precipitation; the South Platte, Colorado, and combined Southwestern basins. Fortunately, statewide year-to-date precipitation showed only a small decrease from 72 percent of average on the first of May, to now 70 percent of normal on the first of June. Statewide reservoirs remain slightly above normal, at 106 percent of average, dropping six percent since May 1. 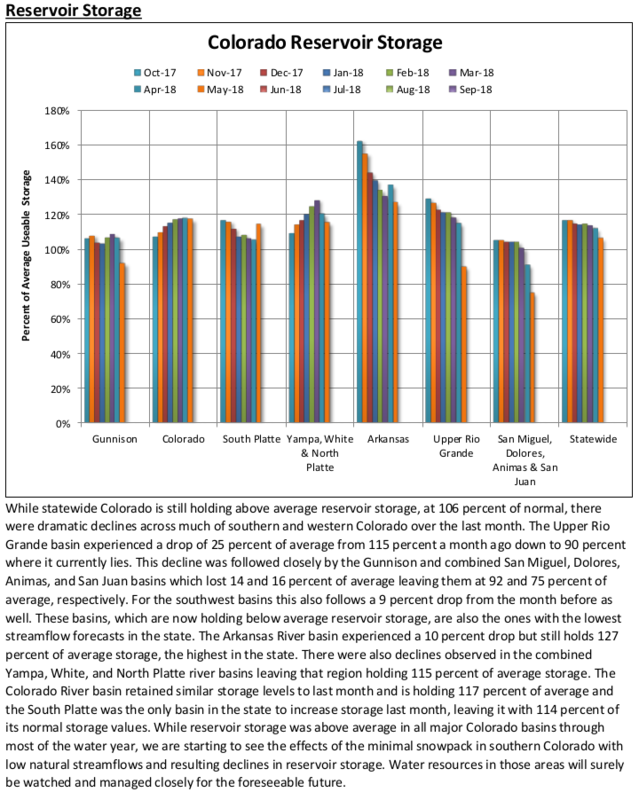 Most of the declines occurred in the southern basins including the Gunnison and combined southwest basins where storage fell 14 and 16 percent, respectively, and most notably in the Rio Grande basin, which fell 25 percent. These decreases in reservoir storage are due to calls for irrigation to supplement receding runoff. Many streams which typically peak in June, peaked in May this year, two to three weeks early. In dry years especially, Domonkos adds, “When streamflows peak early, less water is available later in the summer when it is needed most.” With peak streamflow in the past, streamflows are forecasted near record lows at some stream gauges in the Gunnison, through the southwest corner of the state to the Rio Grande. Shifting the focus northward, basin-wide reservoir storage remains above normal, above 110 percent. 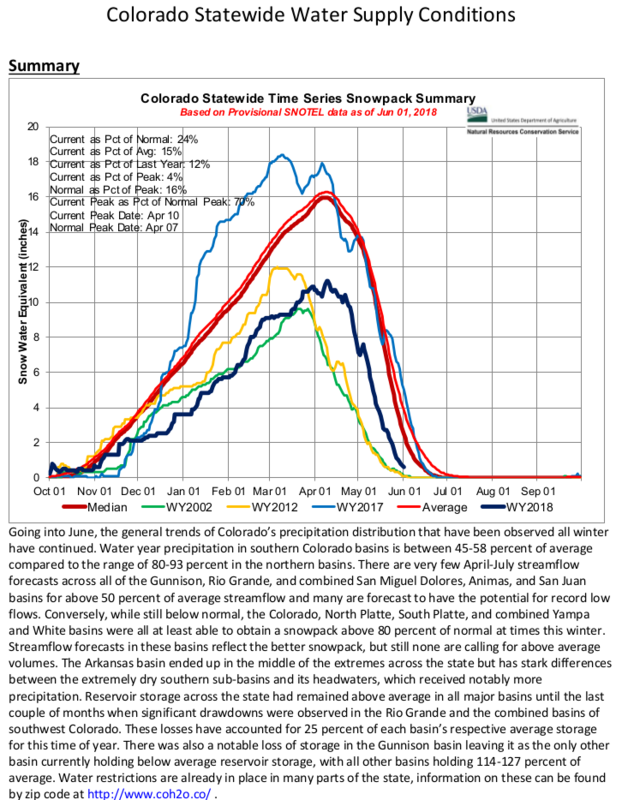 Streamflow forecasts however are generally lower, between 50 and 85 percent of normal. 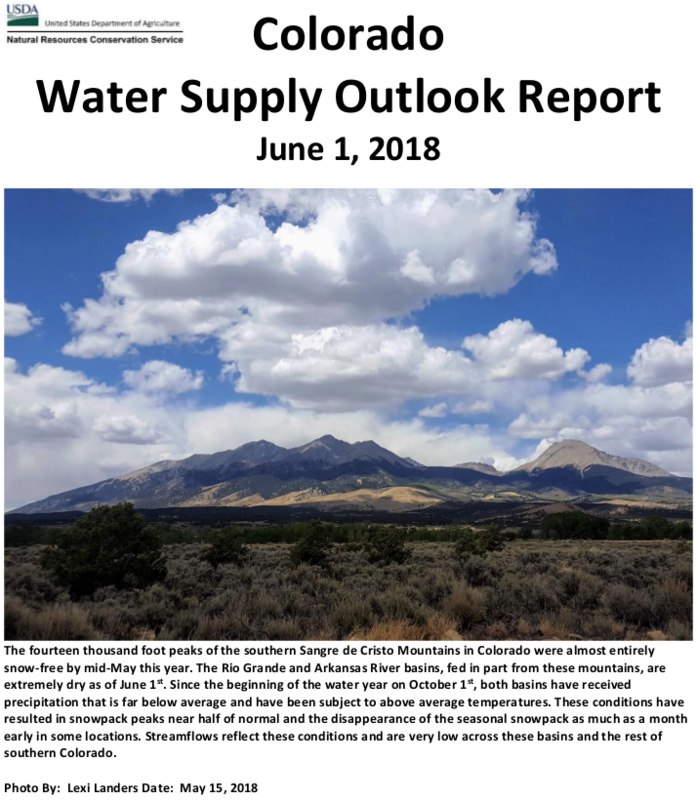 For more detailed information about June 1 mountain snowpack and streamflow forecasts refer to the June 1, 2018 Colorado Water Supply Outlook Report. For the most up to date information about Colorado snowpack and water supply related information, refer to the Colorado Snow Survey website. Flow in the Fryingpan. Photo credit Brent Gardner-Smith (@AspenJournalism). 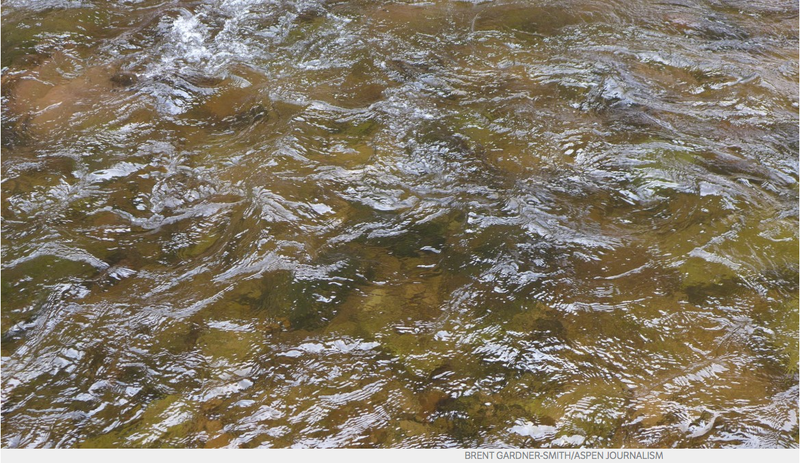 A proposal to increase winter flows on the lower Fryingpan River could have big benefits for downstream trout populations. The Colorado River District is proposing to the Colorado Water Conservation Board a one-year, renewable lease of some of the water it owns in Ruedi Reservoir to boost winter flows in the Fryingpan. CWCB staff presented the proposal to the board at its May meeting in Salida. Currently, the decreed instream flow rate between Nov. 1 and April 30 in the Fryingpan below Ruedi is a minimum of 39 cubic feet per second. Often, winter flows are higher than this, but in dry years they can hover around the minimum amount. But 39 cfs is not enough to maintain a healthy food source for the Gold Medal fishery’s population of trout. 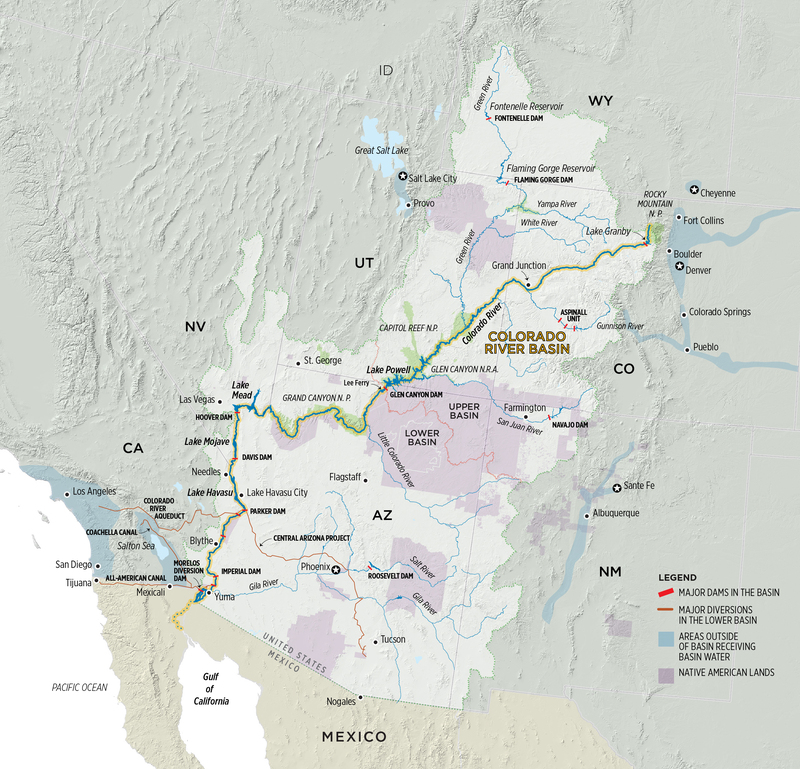 The proposal seeks to boost the minimum flow to 70 cfs. 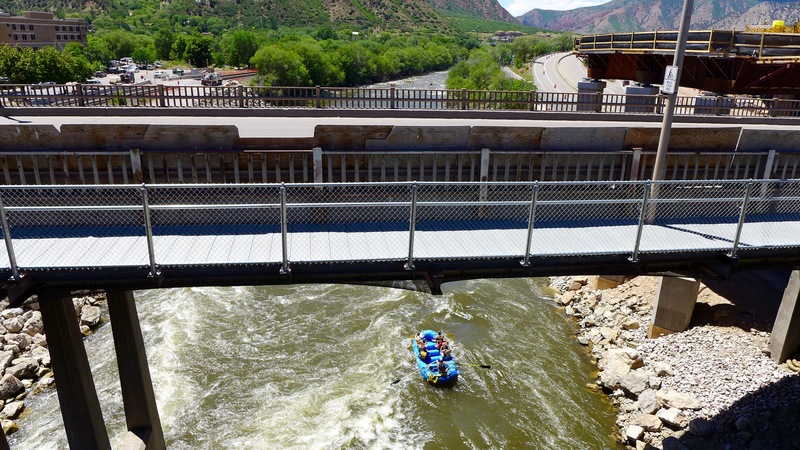 The proposal is a collaboration between the Colorado River District and the Roaring Fork Conservancy. Heather Tattersall Lewin, watershed action director with the conservancy, explained that low streamflows, combined with frigid temperatures, can lead to the formation of anchor ice on the bottom of the river. This ice has a negative effect on the population of aquatic insects, known as macroinvertebrates, which are food for the brown, rainbow, and cutthroat trout that call this 14-mile stretch of river home. Extra water in the stream will prevent anchor ice from forming. The conservancy estimates that 56 days is the maximum amount of time the leased water would be needed during the winter. “This is a great opportunity to manage water to the benefit of environmental and recreational needs,” Tattersall Lewin said. Under the proposal, the CWCB would lease up to 3,500 acre-feet of Ruedi Reservoir water from the river district. It would cost $65.25 per acre-foot, plus a $400 application fee, which for the total 3,500 acre-feet would cost $228,775. The river district owns a total of 11,413.5 acre-feet of water in Ruedi, with 7,500 acre-feet of that available for leasing. Of the total the river district owns, 5,412.5 acre-feet is to support flows for the endangered fish recovery program. Colorado River District General Manager Andy Mueller said there are two reasons his organization decided to offer up their water for lease. The first is to improve the health of the river and its trout populations. The second is related to the business arm of the district. 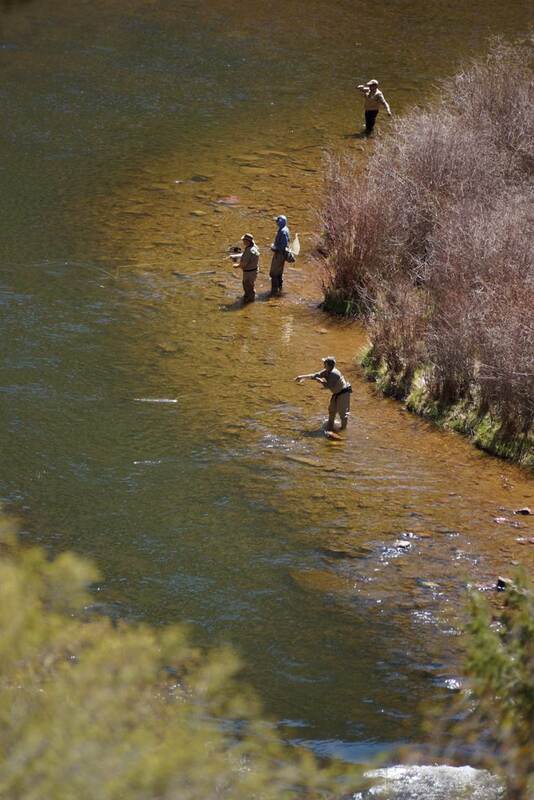 The Fryingpan River is popular with anglers because of predictable hatches that lead to fish feeding frenzies and great conditions for dry fly fishing. Colorado Parks and Wildlife supports the increased winter flows. The CWCB will consider the proposal for approval at its July meeting. If approved, the increase in flows could begin this winter. Editor’s note: Aspen Journalism is collaborating with The Aspen Times, the Glenwood Springs Post Independent, the Vail Daily and the Summit Daily on the coverage of rivers and water. The Times and the Post Independent published this story in their print editions on Thursday, June 7, 2018. The Colorado River has already reached its peak flow for the season, and that’s lousy news when it comes to fire danger, water supply for farmers and residential users, recreational opportunities and the health of numerous fish species, among other things. And while Victor Lee, an engineer with the Bureau of Reclamation, isn’t ready to hit the panic button yet, he concedes that bad can still turn worse. Lee elaborates on Alcorn’s points. Low flows also impact the Colorado River Endangered Fish Recovery Program. The Colorado Water Conservation Board (CWCB) met in Salida on May 23-24, in part, to take final action on grant applications to help implement Colorado’s Water Plan (CWP). The Colorado General Assembly created the grant program in 2017, appropriating $9 million in fiscal year 2018 for projects in six categories—storage ($3 million); water supply/demand gap ($2 million); and agriculture, environment/recreation, conservation/land use, and innovation/engagement ($1 million each).